The King of Bohemia seeks the help of Sherlock Holmes in securing a picture that could be used against him in the political scene. A man comes to Sherlock Holmes seeking advice about the disappearance of a bizarre society of red-headed young men that are funded by a man who sympathized with red-headed men. Miss Sutherland entreats Sherlock Holmes to help her find her mysterious fiancee that has disappeared. However, he did not give her enough information in their rushed engagement. Sherlock Holmes is faced with the Boscombe Valley Tragedy, in which a man is murdered and is son is accused of the crime. Sherlock Holmes is faced with a bizarre case that is a family affair. Two brothers and a son all receive letters from the KKK, addressed from India that contain five dried orange pips, the omen of death. When it comes to be the son’s turn, he begs Holmes for his advice. Mr. Watson finds Holmes in an opium den when looking for a friend who had been missing. 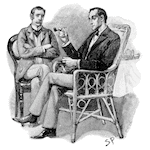 Holmes is studying a case in which a man disappeared from the upstairs room of the den. All that was found was a deformed man with a limp and traces of the man’s blood and clothes with no apparent violence. On the day before Christmas a man is caught in a fight and looses a goose and his hat. Sherlock Holmes is trying to figure out who the hat belongs to, when a blue carbuncle is found in the goose. A woman comes to Sherlock Holmes begging for his help to solve the mystery of her sister’s death. Quite a sum of money is offered for their dowries and her sister consequently died before her wedding day. Now the woman is afraid that she will meet the same fate. A man knocks on Watson’s door early in the morning and he discovers he has a missing thumb from a murderous attack in the night. They resolve to go see Sherlock Holmes about the case. Sherlock Holmes is faced with the case of the Lord St. Simon marriage in which the bride disappears after the ceremony, excusing herself to her room claiming to have a sudden indisposition. A banker makes a very big loan to a prominent customer and receives a beryl coronet to hold. He discovers his son trying to harm it and he has a case against him when he begs for the expert help of Sherlock Holmes. A woman employs Sherlock Holmes to keep watch over her as she takes a mysterious position as a governess. The woman has to comply to bizarre requirements and senses something amiss in the environment of the house.